December 23, 2017 (Tony Cartalucci - NEO) - Years ago, those confronting and questioning the Western media's "pro-democracy" narrative regarding Myanmar opposition leader Aung San Suu Kyi, her National League for Democracy (NLD) political party and her supporters including saffron-clad supposed "Buddhist monks," were ridiculed and dismissed. Warnings that Suu Kyi's political movement was nothing more than a foreign-funded attempt to co-opt the people and resources of the Southeast Asian state of Myanmar - a former colony of the British Empire still referred to widely in the West by its colonial nomenclature, "Burma" - were dismissed as mere conspiracy theories. Meanwhile, concerns that violence targeting Myanmar's Rohingya minority was in fact being bolstered by Suu Kyi's rise to power were intentionally and concertedly sidestepped by the Western media who attempted to conceal the true nature of Suu Kyi's political party and the core "values" of her support base and shift blame onto the ruling military-led government. It was inevitable that upon taking power, Suu Kyi and the NLD - enabled by decades of US-UK-EU financial, political, and material support - the progressive veneer applied to this "democracy icon" would begin to peel, and the true nature of her and her followers would reveal itself. In an immense amount of irony, prominent Western media organizations like Reuters now find themselves decrying the very government they themselves spent decades helping into power, as the government cracks down on reporting over the ongoing Rohingya crisis. Two Reuters employees - Wa Lone and Kyaw Soe Oo - were reportedly arrested after illegally obtaining documents from Myanmar police. Reuters and the myriad of faux-human rights advocates that conspired with the US, British, and European governments to put Suu Kyi into power are now calling on the Myanmar government - though not Suu Kyi by name - to release their colleagues. Reuters employee Andrew Marshall has recently flooded his social media accounts with desperate pleas for his colleagues' release, citing US "demands" that Myanmar release them, and alluding to the debt Suu Kyi and the NLD owed the foreign press for their role in bringing them to power. Yet even now, as Reuters finds two of its own rendered as collateral damage in the wake of Suu Kyi and the NLD's ascent into power, both this most recent row regarding Wa Lone and Kyaw Soe Oo and the ongoing Rohingya crisis are only obliquely linked to Suu Kyi by the Western media. Marshall - for example - continuously cites "Myanmar's president - Suu Kyi's ally" as supporting the prosecution of his colleagues - either unaware or unwilling to admit that Suu Kyi herself created and currently occupies the highest office - State Counsellor - referred even by the Western press as the "de facto" head of the Myanmar government. Suu Kyi has both the political power - and since her office itself is an exercise of extralegal power - the legal power to act on a number of issues Reuters and other within the Western media continuously attempt to raise in regards to Myanmar. Yet despite this, the lack of responsibility assigned to her stands in stark contrast to other crises around the globe, particularly in Syria where the nation's leader, President Bashar al-Assad is wholly blamed for all regardless of the logic, legality, or legitimacy of Western accusations. Marshall also repeatedly referred to Wa Lone and Kyaw Soe Oo as "truth seekers" and "real journalists," yet one wonders just how accurate such labels are. 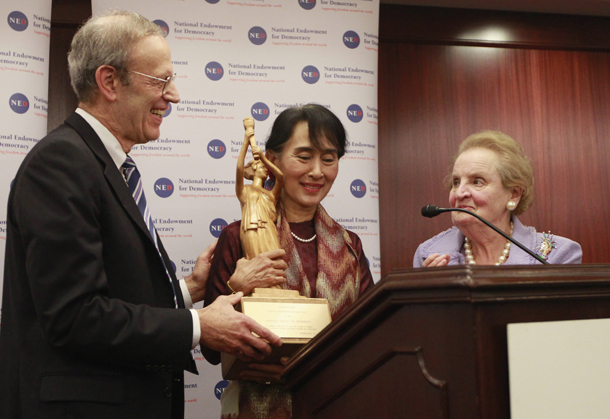 Real truth seeking journalists would have noted and reported years ago of the compromised nature of Aung San Suu Kyi and her National League for Democracy and the contradiction in terms a "democracy icon" was when Suu Kyi's entire movement - from her party to supposed "nongovernmental organizations" (NGOs), academics, and media platforms - were created, funded, and directed by and solely for foreign interests. Indeed, in what sense is Suu Kyi's political movement a representation of Myanmar's self-determination - the foundation of any genuine democracy - if that political movement is a product of Washington and its interests, not Myanmar's and its people's? 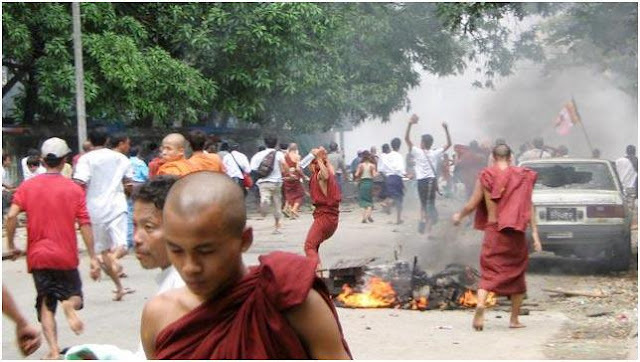 It was in a 36 page 2006 Burma Campaign UK document titled, "FAILING THE PEOPLE OF BURMA? A call for a review of DFID policy on Burma (PDF)," that it was revealed how virtually every aspect of Myanmar's opposition was funded and directed by foreign governments, the US via USAID, the National Endowment for Democracy (NED), and convicted financial criminal George Soros' Open Society and the UK via the Department for International Development (DFID) being chief among them. The NED sub-grant program also has fostered the development of three well-known Burmese media organizations. The New Era Journal, the Irrawaddy, and the Democratic Voice of Burma (DVB) radio have become critical sources of independent news and information on the struggle for democracy in Burma. These organizations also serve as training ground for the development of professional Burmese journalists. 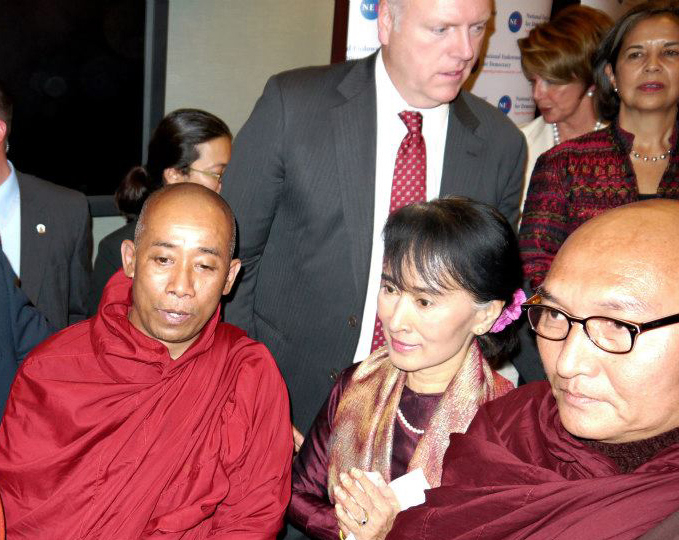 Voice of America (VOA) and Radio Free Asia (RFA) have Burmese services. VOA broadcasts a 30-minute mix of international news and information three times a day. RFA broadcasts news and information about Burma two hours a day. VOA and RFA websites also contain audio and text material in Burmese and English. For example, VOA's October 10, 2003 editorial, "Release Aung San Suu Kyi" is prominently featured in the Burmese section of VOAnews.com. RFA's website makes available audio versions of 16 Aung San Suu Kyi's speeches from May 27 and 29, 2003. U.S. international broadcasting provides crucial information to a population denied the benefits of freedom of information by its government. Broadcasts reach a broad spectrum of society and a broad swathe of the country, influencing Burmese decision-makers and offering support to future democratic leaders. Anecdotal evidence indicates that government officials listen to these broadcasts frequently. In addition to simply funding and running the existing opposition, the US and UK actively sought to expand it through "scholarships" in which citizens of Myanmar would be indoctrinated abroad before being sent back to help sow subversion on behalf of "Western values." The State Department provided $150,000 in FY 2001/02 funds to provide scholarships to young Burmese through Prospect Burma, a partner organization with close ties to Aung San Suu Kyi. Many of those lining Suu Kyi's regime have literally been built up professionally and politically by the US and UK government. The current Minister of Information was trained by US NED and Soros money and is heading the very ministry that is pursuing Reuters' employees now, along with anyone else impeding the current government's objectives. It is clear that for years, the US and UK meddled directly and deeply in the internal political affairs of Myanmar - a crime the US is now accusing and condemning Russia of. Unlike in the case of accusations against Moscow where no evidence has been provided, Reuters' "truth seekers" had only but to click on the Burma Campaign UK's website and read the document still publicly available there detailing US-UK meddling in Myanmar's political affairs. Yet they did not. While Reuters and others went through great lengths to promote Suu Kyi as a "democracy icon" above criticism, she represented precisely the opposite of democracy - particularly self-determination. She was a creation of, by, and for foreign interests - and despite this obvious fact - Reuters and others never reported this to the public. Evidence of Suu Kyi and her followers' animosity toward the nation's Rohingya minority was also intentionally concealed for years by these "truth seekers" and "real journalists." The "Saffron Revolution" of 2007 was depicted by the Western media as a peaceful pro-democracy uprising crushed by a brutish military junta. Yet in reality, these "saffron" supporters were engaged then in violence, as well as the chief protagonists driving hatred and violence against the Rohingya. It was warned as early as 2012 that Suu Kyi's support base was comprised of violent extremists, used intentionally by the US and UK as proxies to undermine Myanmar's military-led government, to protest specific joint China-Myanmar projects including mines and dams, as well as ignite conflict that would drive Chinese interests out of Rakhine state - the epicenter of the current Rohingya crisis. It was also warned long before Suu Kyi came to power, that should she lead the nation, the Rohingya would suffer first and foremost. Again, the West's "truth seekers" failed to properly assign responsibility for the violence to Suu Kyi and her supporters - instead - reporting violence as ambiguously as possible, insinuating that it was the military carrying it out when in reality it was often the military serving as the only line of defense between Rohingya communities and their entire annihilation. It was lies and intentional disinformation that created the monster that is now Suu Kyi and her NLD. The extensive full-spectrum support provided by the US and British governments along with the Western media's role in spinning and covering up the truth led directly to the current Rohingya crisis in Myanmar and to the arrest and disappearance of two Reuters employees. While Andrew Marshall of Reuters seeks to obliquely blame anyone but Suu Kyi, he and others may eventually summon the courage to do so one day. Whether or not they can look in the mirror and rightfully find blame and answer for their own role in Suu Kyi's rise to and abuse of power is another matter entirely. But until they do so, the monster of Myanmar will continue to grow, and many others just like it will grow with it. Ironically - while Marshall, the rest of Reuters, and the Western media wring their hands over Suu Kyi's "sudden" change of heart, in neighboring Thailand these same people are attempting to return Thaksin Shinawatra and his political allies to power in the name of "democracy" - a scenario that will turn out equally as bad for Thailand as Suu Kyi has for Myanmar.